The first CMQG charity project is well underway! 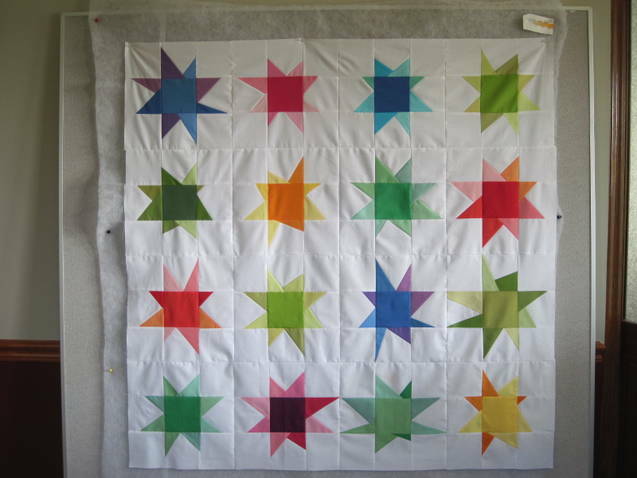 Twenty nine of the wonky star blocks were returned at the last meeting, enough to complete one quilt top. Many thanks to Pamela for piecing the top and to Cristin for volunteering to quilt it. I hope to collect the remaining blocks at the next meeting - Thursday, June 28th. I would love to have both quilts pieced, quilted and bound for our August meeting so they can make their way to Japan. If you still have a wonky star block PLEASE bring it to the next meeting! If you cannot be at the meeting drop me an email (k_hofferberth[at]yahoo[dot]com) to arrange for delivery of your block. As we bring this project to a close I will be looking for our next charity project - if you have any ideas please share them! Also, if you would be willing to help me coordinate future charity endeavors please let me know. You know the saying, "Many hands make light work". What time is the meeting thursday? I only see the May meeting listed for upcoming events. I might actually get to come this thursday night!!! I'm working on quilting this bad boy today! I know I know, nothing like waiting till the last minute, right?! It looks great so far! It is going to bless the recipient family for sure. Wow! It's gorgeous! Go us! Sew-In on Saturday, August 6th!